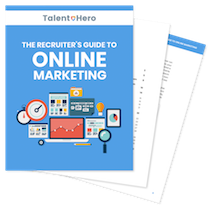 Over the years, the average recruiter will build a list of thousands of emails from candidates they’ve placed, past clients they’ve worked with and thousands of other people who they contacted but ended up not engaging. What happens to these emails? For the most part, nothing. They sit in a CRM or spreadsheet and are infrequently contacted on a one-off basis. But what if instead of sitting idle, those emails were used to stay top of mind and demonstrate your expertise to both clients and candidates? Of course, everyone would want to do that but most people don’t. Why? Because, like almost everything that is not a core part of your business, it takes too much time. So let’s first look at why it’s worth your time and how you can create a weekly newsletter in a fraction of the time. In a world with dozens of actively used social media platforms, it may seem a bit weird for recruiters to focus on something as old-school as email newsletters. But there’s a good reason to do so. Study after study has shown that email easily has a broader reach than Facebook or Twitter. In fact, if you have 2,000 email subscribers, 2,000 Facebook fans and 2,000 followers on Twitter, here is the reach you can expect from each platform. Email still absolutely crushes social media. And the best part is that you don’t have to go out and find all of your email subscribers. You likely already have your list. And when you engage people on your list, you get two hugely valuable benefits. First, you stay top of mind with past candidates and clients. When a candidate is looking to move positions, they are far more likely to contact the person who has stayed in touch with them over the years rather than someone who worked with them for a month or two and never spoke to them again. The same logic applies to clients who need to fill new roles. Second, you demonstrate your expertise. Every recruiter knows that showing domain expertise is critical to highlighting the value you will bring to a candidate looking for a new job or a client looking to fill a new role. Now imagine if you had the opportunity to provide that expertise on a weekly basis. That’s the power of email newsletters. So what’s the downside? Most e-mail newsletters are awful and nobody reads them. If you’re going to send out updates about your business or crappy blog posts that you wrote in 30 minutes, you might as well keep your email list inactive since people are not going to open them and they certainly won’t read them if they do. So how do you create a kickass email newsletter without spending hours each week? Two words – content curation. Every week, you likely come across dozens of articles that interest you. These could be articles on the nitty gritty details of your industry, the economy as a whole or even stuff that you just find interesting. Many of you even share those articles over email with colleagues and friends. Now instead of just sending them out to a few people, what if you saved them and sent them out later to your entire email list? You now have the starting point for your newsletter. So now that you get the basic concept of content curation, what are some things to think about? Here are three important considerations. If you’re an IT recruiter specializing in SAP, it would make sense that most of the articles you share with your email list are about updates to SAP software or general trends in IT. These types of articles demonstrate that you stay on top of the news in your target industry and know the direction the market is headed. Furthermore, you’re more likely to engage your candidate and client base if you speak about topics that interest them. However, that doesn’t mean there shouldn’t be some room to freestyle. If you want to mix in an article about a lost dog that found its way home, a GIF of a cute kitten or a video of a soldier returning home from overseas, do it! Mixing in non-industry content in an industry-focused newsletter is the perfect way to a) humanize yourself and b) add a little fun to what may become a bit tired over time. Think about this from the perspective of the email recipient. If they expect that your newsletter is all business, they could grow weary of opening it, especially during non-business hours. But if they know it’s a bit of work and pleasure, they’re more likely to get a positive feeling when they see it in their inbox and continue to engage on a frequent basis. 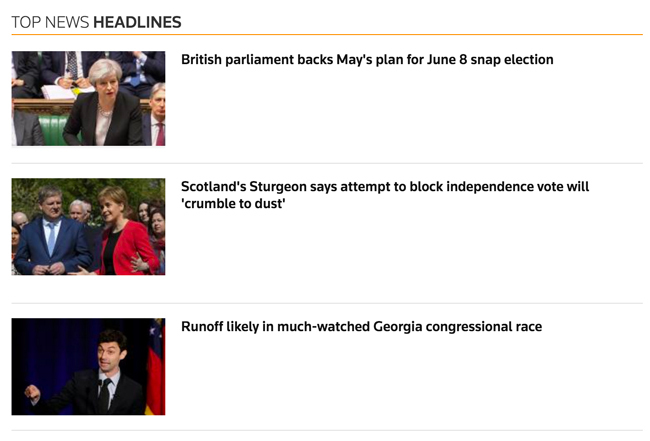 I’ve seen a number of recruitment agencies take a stab at content curation and do so by sending out a list of headlines and links to the article. Don’t do it! While gathering articles rather than writing detailed blog posts is primarily done to save time, you can take the time-saving concept too far. If you’re going to curate content for your readers, make sure that you actually tell the reader why they should care. And if you want to learn how to do it, look no further than theSkimm. 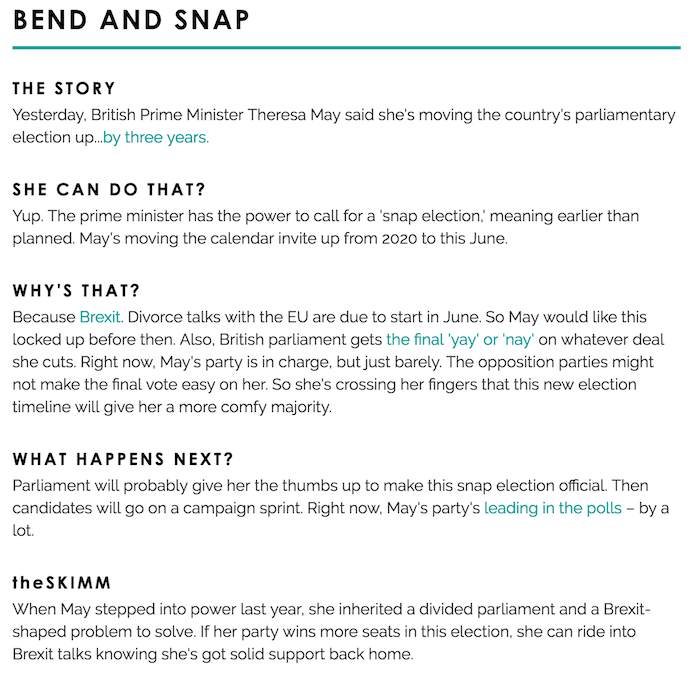 The masters of content curation, theSkimm knows precisely how to summarize an article so you know what it’s about and will want to read more if the topic interests you. Look at this pithy little summary below and tell me you aren’t impressed. Your email list has thousands of people on it and unless you’ve been working on building an opt in list previously, precisely zero of them have asked you to send them a newsletter. While you technically have the option of emailing anyone you want until they ask you to stop (at least in the US), you probably don’t want to piss off potential new clients by spamming their inbox on a weekly basis with a newsletter they never read. Instead, before you get started, send out one or two emails to your entire list pitching your newsletter and asking the recipients if they want to subscribe. Include a sample of what the newsletter will look like in the body of the email so they know what to expect. Then, only send the newsletter to people who have opted in. This ensures you have an audience that is engaged and cares about what you’re sending them. Now that you know the benefits of email newsletters, it is clear where you need to direct your attention. Dust off that old list of emails, get people to opt in and start sending your newsletter. To stay up to date, subscribe to our newsletter in the box below.